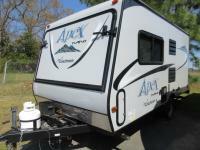 This Apex Nano model 15X is the perfect expandable travel trailer for a family of 4-6 that enjoys camping in the great outdoors but needs a few comforts of home inside. The full corner bath is conveniently located across from the entry door for easy access in and out when having fun outside. Two comfortable queen tent end beds can be found up front and in the rear for a great night's rest, plus the booth dinette and the sofa provide extra sleeping space if needed. 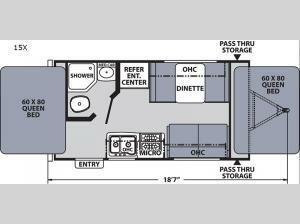 You will find plenty of storage throughout on the interior along with a front exterior pass-through compartment that is accessible from either side for your outdoor camping gear. Take a look today! Each Coachmen Apex Nano expandable is super light in weight and features a vacuum bonded Azdel fiberglass sidewalls and an Aluma-cage construction with a welded aluminum framed floor. Each expandable contains well built Pewter Maple cabinetry with hardwood mortise and tenon cabinet door frames, as well as Congoleum diamond flooring throughout. You will also enjoy the high efficiency LED interior lighting, the AM/FM stereo with Bluetooth, the Evergreen sleep mattress, and the stainless steel microwave for you to warm up a quick snack. The skylight in each bath brings in more natural lighting and the outdoor shower helps eliminate any mud tracked through the expandable!